It has been several years since I have posted on this site. 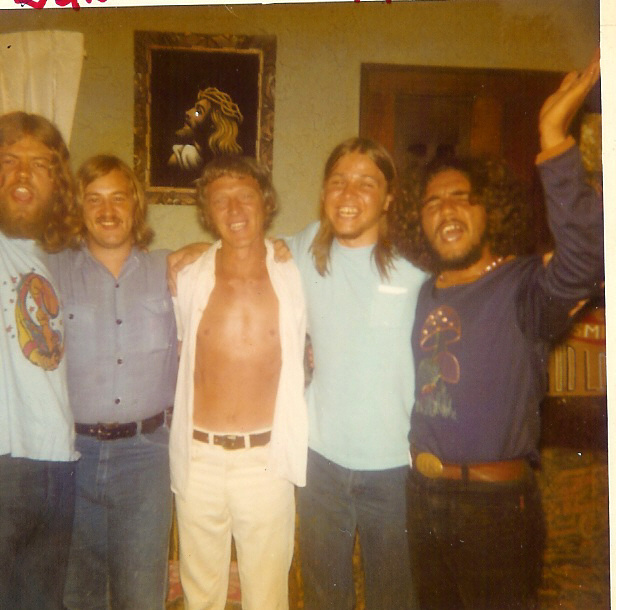 Just recently I heard an interview with Greg Hough one of the founding members of Petra, probably the best and most well known hard rock band to come out of the Jesus Movement. 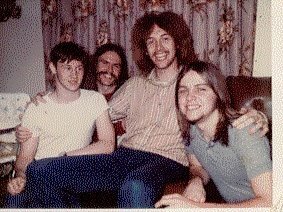 Greg gave his life to Christ in October of 1971 at "Jerry's" which I have written about in several of our early posts on this blog. Greg mentions a young woman who prophesied over him the Lord would use him and that he would play rock music for the Lord all over the United States. Some of you who read this will remember Martha, who was married to Kurt. The where a great couple, but unfortunately they divorced after a few years of marriage. My memories of Greg is that he was a really nice guy who genuinely wanted to serve the Lord. This interview certainly shows the same guy, more than forty years later. Enjoy this interview. The interviewer credits Greg Hough with "creating a new genre of music, Christian Rock." The guy doesn't know his history very well. 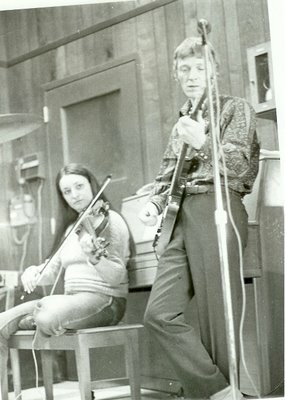 Certainly Greg and Petra were pioneers of Christian hard Rock, but there were numerous bands, as early as 1970 or earlier, playing hard rock for Jesus. The local Indianapolis band "e" is an example. They were playing hard Christian rock before Petr. Grex X Volz, lead singer for "e" band later joined Petra on their third album. "Jerry's" in Anderson attracted rock and rollers. 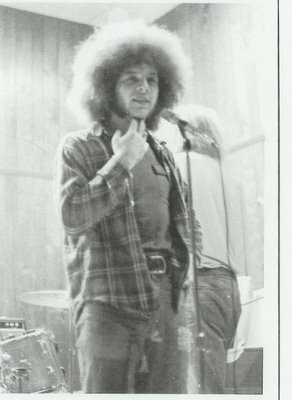 Another "e" band musician, Greg Dunteman, was from Anderson. He was 15 years old when he came to Jerry's and began following the Lord. It has been several years since I have posted on this site. 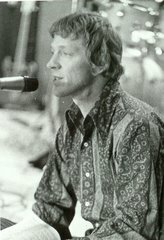 Just recently I heard an interview with Greg Hough one of the founding members of Petra, probably the best and most well known hard rock band to come out of the Jesus Movement. Greg gave his life to Christ in October of 1971 at "Jerry's" which I have written about in several of our early posts on this blog. Greg mentions a young woman who prophesied over him the Lord would use him and that he would play Rock music for the Lord all over the United States. My memories of Greg is that he was a really nice guy who genuinely wanted to serve the Lord. This interview certainly shows the same guy, more than forty years later. Enjoy this interview. Ray Renner was one of the leaders of the Jesus Movement in the Anderson area. He was deeply influenced by the Anderson Revival, so much so that it entirely changed the direction of his life. 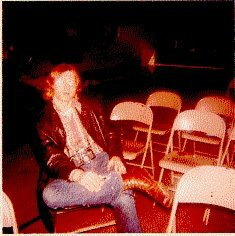 Ray has been blogging about those early days on his own website. You will have to visit his web page to see his photos. Ray has given me permission to copy his testimony to this blog, here it is. Ray will write more in the future. I for one am looking forward to "The Rest of the Story"
I was born in Billows, KY in 1947. As the pictures above show I was a pretty skinny kid until later in life. I grew up in Somerset where I attended school until I finished my junior year in high school. 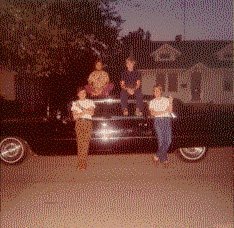 My family then relocated to Indianapolis, IN where I graduated from Washington High School in 1965. We won the state tournament in basketball that year and then again four years later when one of my brothers graduated. You’d have to understand high school basketball in Indiana in the 60s (before class basketball began) for that to be meaningful. Soon after graduation I applied for and received a job at Eli Lilly, a leading pharmaceutical company headquartered in Indianapolis. I started out in the service department mopping floors and taking out trash. In fairly short order I interviewed for and received a job as an assistant lab tech and began what was a dream job for me with a lab of my own working for a chemist. I was in heaven I thought. It was short lived as I was drafted into the army in 1967. Hell was on the way. My entrance into the army was during the height of the Vietnam War. By early March of 1968 I was hiking through the jungles of SE Asia as a member of the 101st Airborne division. Shortly before leaving for ‘Nam I prayed a desperate prayer that went something like this “Lord, if you’ll bring me back from Vietnam alive I’ll do anything you want me to do for the rest of my life.” A huge sense of peace settled over me though I was not really living for the Lord at the time. Nevertheless, somehow I knew I was going to survive Vietnam. During my year in Vietnam my unit saw a good bit of action. Barely two weeks into the country, I was wounded in a fire fight during the middle of the night. We had set up an ambush along a well worn jungle trail. Shortly after dark all hell broke loose as a company of North Vietnamese soldiers came walking down the trail with their rifles slung over their shoulders. In the first few minutes of the fight I was struck in the hand by a bullet from an AK 47 while feeding ammunition into a machine gun for my partner who was in charge of our position. My hand was in front of my face at the time. The Lord spared my life that night and I spent the next month in the hospital with a bullet wound to my hand. When I returned to my unit a month later I was assigned as a radio telephone operator (RTO), a position I held for the rest of my tour. While that meant that I was carrying an extra 24 lbs on my back it also meant that I knew more about what was going on than most any one else in the company since it was my job to facilitate communication between our company commander and/or first sergeant and our rear command structure. This included calling in artillery and air strikes to support our field operations. During my year in ‘Nam my unit was first located at Phouc Vinh which was a short drive (not that we were driving) from Ben Hoa Airbase. Later we went on operations near Cu Chi in the Mekong Delta and to a fire base near Dak To in the Central Highlands. The last part of my tour we spent in the northern part of the country. First we went on operations near Hue/ Phu Bai and finally we were stationed at Camp Evans, just north of Hue and south of the DMZ as I recall. Other than an occasional walking patrol near our base, virtually everywhere we went we traveled in helicopters. I don’t have many pictures or artifacts from Vietnam because most of what I sent home (not much) was burned up in an apartment fire of a young lady I was seeing before I left. Most of the pictures I have left are on this page. While I still remember the general gist of my year in Vietnam the details have long since faded. Our unit moved around a lot, got into a number of fire fights and then moved on again. We never held any ground we took for very long though we often had men killed or wounded in the battles. In my opinion it was a senseless way to fight a war. Many Vietnam vets became embittered by the senselessness of it all as well as the carnage to which we were subjected. It didn’t help that, when we returned home, we were treated as the villains of the war, though the decisions for fighting this war were made by politicians in Washington and not soldiers on the ground. I’ve seen pretty much all of the Vietnam era movies. Most of them had elements that represented the story I lived though none of them captured it exactly. The hardest one for me to watch was “Deer Hunter” because it reminded me of how little human life was valued in the war by both sides. I was visibly shaken after the movie and asked my wife Carol to drive us home. I returned from the war pretty messed up in my mind. I had taken a lot of drugs (they were easy to get and cheap) and was drinking a lot to kill the emotional pain though it only masked it temporarily. Upon returning from ‘Nam I was stationed at Ft. Riley, Kansas for the last few months of my time. I got out of the army in September ’69 and returned to work at Lilly’s. Soon, however I decided I needed to continue my education. I applied at both Purdue and Anderson College (later Anderson University). I was accepted by both and had pretty much decided to go to Purdue when, at the very last minute, I changed my mind and decided to go to Anderson. I think a praying mom; family and friends had a lot to do with that (in fact I’m sure it was their prayers that brought me home alive). 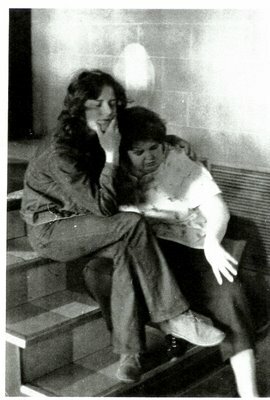 I arrived at Anderson College in January 1970 in time for second semester to begin. That innocent enough decision would turn out to have major ramifications for my life. That’s beginning of the next chapter in my life. February 22, 1970 was destined to be a significant turning point in my life; perhaps the most significant one of all for it was on that day that I had a revolutionary encounter with Jesus. I could not have known when I awoke that morning with a hangover from drinking too much the night before what lay ahead for me. I had been drinking heavily since exiting Vietnam a year earlier. This day, however, would be different. I slept late that morning in my college dorm room. By mid-afternoon the dorm was abuzz with stories from a local church in town. It seems that the meeting at South Meridian Church of God went longer than normal; instead of getting out at the usual hour of noon the meeting went until 1:30 PM. This was clearly out of the ordinary. On top of that there were stories of strange happenings at church that morning. A “witness team” from Asbury College in Wilmore Kentucky had been invited to come and tell the story of a spontaneous revival that had taken place on their campus a couple of weeks earlier. So great was the move of God on campus that classes had been cancelled for an entire week at both the college and the seminary. Meetings had gone on around the clock in Hughes Auditorium as students and professors shared what the Lord was doing in their lives. Apologies were given publicly and forgiveness was asked for and granted in the meetings. The atmosphere was electric with the presence of the Lord. And now this same Spirit of revival had come to Anderson. By evening a few of my friends and I decided to check out the evening meeting at South Meridian to see for ourselves what was going on. I went more out of curiosity than anything else. We arrived at the meeting a few minutes late and had to sit in the third row from the front because all the good seats in the back were taken. Within a few days you had to arrive an hour early to get a seat in the main auditorium at all. In fact at the height of the revival the church gymnasium was also filled as an overflow each night. As we entered the building that night there was a “holy hush” in the air and the love and presence of the Lord was so palpable it seemed like you could cut it with a knife. We quietly took our seats and waited to see what would happen. We didn’t have long to wait. As each of the students from Asbury stood to share they had a similar tale to tell. It went something like this, “We told you everything we knew to say this morning and there’s not much left to tell.” I was getting more and more disappointed with each passing speaker. And then it happened. “Jesus, Oh Jesus, do you know Him today? Please don’t turn Him away. Then she sang the chorus in Spanish and that’s when things began to happen for me! “Cristo, OH Cristo!’ Immediately I had what even now seems to be a very mystical experience. I had grown up under the shadow of the “H” bomb and the constant fear of the annihilation of the world during the “Cold War”. I had always believed that there must been something that is so true that even if the world were blown away completely it would remain. I had suspected that the truth might be Jesus since I had grown up going to church. Now I was being challenged to believe that He was and is in fact the one eternal truth of the universe. The Lord began to speak to me in terms that were exceedingly clear. He said “About 2 1/2 years ago you made me a promise. You said if I would bring you back from Vietnam alive you would do anything I wanted you to do for the rest of your life. I brought you back from Vietnam alive. What are you going to do with your promise?” At the same time He was speaking to me He showed me a movie-like playback in my mind of my year in Vietnam. It was as if I had been taken outside of my body and was being allowed to look down on myself as I walked through the jungles and rice paddies. I saw times when I could have been killed and times when I should have been killed and yet I was alive. He showed me at least a half dozen times when my life had been in imminent danger. Then He continued to speak to me. He said “Not only did I save your life in Vietnam but I bought your life at Calvary.” I didn’t even know at the time that the Bible says “You are not your own, you were bought with a price” (1 Cor. 6:19). Only later would I learn that the price Jesus paid for me was the shedding of His own blood. He showed me another vision (a picture in my mind’s eye) of Jesus dying on the cross with the blood dripping from His hands and feet and I knew without a doubt that He had died for me personally as if I was the only person on the planet at that moment who needed His love. My mind began to reason something like this “If He saved my life in Vietnam and He bought my life at Calvary then on both counts He owned the rights to my life. I no longer could or did belong to me, I belonged to Him. Whatever life I had left I had to live for Him.” It was settled. I headed for the front of the church to the altar where I could pray. We were barely 15 or 20 minutes into the service. Unknown to me was the fact that a number of my friends from school had been praying for me. They quickly followed me to the altar to pray with me. I didn’t know any formal prayers and hadn’t even learned about the 4 Spiritual Laws and so for me it was a very logical prayer that went something like this. “You saved my life in Vietnam, you bought my life at Calvary, you can have my life!” That was it! No bells, no whistles, no choirs of angels. And yet something was different. In fact everything was different! I got up from that altar knowing my life was changed forever. I was no longer addicted to drugs or alcohol or cigarettes. Where previously I had been filled with prejudice and hatred and bitterness and anger from the army and the war, now my heart was filled with love for everyone. I was radically different inside. I felt clean inside, washed, free! Though it was still winter and there was some dirty patches of snow on the ground the air seemed pure, the sky blue, the snow beautifully white. I felt like a bird that had been let out of a cage! I began to share what had happened to me to everyone I knew and I began to cry. Almost every time I opened my mouth for the next two weeks I cried. I now believe the Lord was doing an emotional healing in me from the scars of Vietnam though at the time all I knew was I couldn’t stop crying. The revival at South Meridian lasted for 50 days. Five days a week there was a morning prayer breakfast at a local hotel, a noon prayer meeting in the city council chambers at City Hall and the evening meeting at South Meridian. On some weekends meetings were held on Sunday afternoon at a local high school gym. 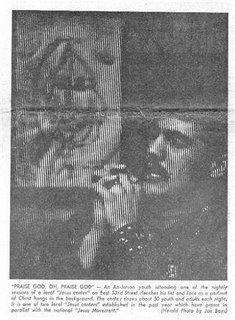 I even remember singing a solo at one of those gatherings (good grief-whatever was I thinking?). On most weekends I couldn’t tell you what went on at the meetings because myself and scores of others were scattered across the country on ‘witness teams” to tell what the Lord was doing in Anderson and in our lives. I first visited Jerry’s in the fall of 1971, sometime in late October. In the spring of that year, I had given my life to Christ at the local Assembly of God church in Anderson. I had recently moved back to Anderson after living in Greensboro, in Henry County during my high school years. As a young hippie I had felt welcomed by the AoG church, but was very out of place. The church was all factory workers and church kids. I couldn’t relate to them, and they couldn’t relate to me. As a result, I had drifted in and out of church all spring and summer. By the Fall I was hungry to find a place I felt a part of, and knew I needed fellowship of some sort. I just didn’t fit into the local church scene, nor did I really fit into the Solomon’s Porch / Fishermen group scene. Several days before visiting Jerry’s I had been at a small church in Pendleton, where the Fishermen sang and preached (I can remember Ray Renner singing “The Lighthouse”). The Lord did a powerful thing in my life that night. After the meeting, as I went outside a young woman was handing out “Smile, God Loves You” cards, Jerry’s calling card with his address and phone number. The next day I called the number, talked with someone (I found out later that it was Myrtle Street, Jerry’s mom) and asked what did they do, and could I visit. I was warmly invited to come and see. That night I drove out to 53rd street, found the house, and made my way in. Inside the door I was greeted by Jerry’s Mom, Myrtle, who put her arm around my waist, hugged me, smiled and said “You must be Mike”. We walked through the house and into the living room. One of my first impressions was “Wow, you could choke to death on the cigarette smoke”. Almost everyone was smoking! I had recently quit smoking and was a bit surprised at a “Christian” gathering were so many people smoked cigarettes. 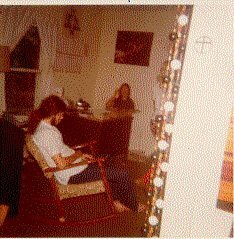 Jerry was seating in his customary place, in the corner of the living room, Rickenbaker guitar in hand, singing. The first thing you would notice about Jerry was his really big smile, and his laugh. He also looked older than his early thirties. He also didn’t look like a hippie, or any preacher I had ever seen. The second thing I noticed was that the room was full of people like me, hippies, freaks, however you wanted to call them. They were my kind of people. I felt at home, if somewhat taken aback by the smoking. I sat down on the sofa with several others and just watched and began to take in what was happening. Jerry would sing for a while. Quote a few scriptures and preach a bit. People would pray. There were lots of “Praise God’s” and Hallelujahs. At times everyone would gather in a circle and all arm in arm pray out loud shouting and exclaiming. Jerry would always be praising God and laughing for the shear joy of what was happening. Sometimes a person would fall on the floor in an ecstatic expression of worship. I know that many of us had different experiences at Jerry’s. My experience was influenced by my having come to faith before I met Jerry. I clearly remember sitting on the sofa that night and the Holy Spirit speaking to me “be careful, there are some strange things here”. Being really Biblically ignorant, it took me a long time to figure out and discern some of the issues. What were some of those “strange things”? Jerry preached that the Scriptures taught that if you had faith, you would never have to physically die! Jerry was anti-church, not just anti-religion, but anti-church, or at least his limited understanding of church. Anderson Indiana was a center for the “Holiness Movement”, and many churches were very conservative and lacked love, but in retrospect, Jerry threw the baby (the church), out with the bathwater (religion). There were other controversial teachings during those years, but they can be discussed at a later date. In my opinion, and I know that others disagree; Jerry never preached a clear salvation message in those early years. Many young people came through Jerry’s. Many were touched by what happened at Jerry’s, however I believe that many were never born again and never made a real, solid decision to follow Christ as a disciple, because Jerry being theologically ignorant and an anti-intellectual couldn’t really teach us the basic foundations of the Christian life. If Jerry would of had a good theological understanding of the Church, and how to disciple young people, he could have been a leader on par with some of the best in the Jesus Movement. He was a genuine man with very little ego. He never manipulated us and he never took advantage of an yone or sought financial gain from his work. Jerry’s was an interesting time and place. It met the needs of many who would never have darkened the door of a traditional church. Jerry and Myrtle Street had a love for young people and accepted us just as we were, sometime to our detriment. Jerry Street had a profound impact upon my Christian life. To this day I still deal with some of the things that happened in those nearly two years. I have often wondered how my life would have been different if I had never met Jerry Street. God alone knows the answer. If you were one of those who took part in what was “Jerry’s” I would love to hear from you. Tell me what you remember and what you think about what I have written. On New Years day 1972 six of my buddies were gathered together after a late celebration the night before. We were hanging out at the bowling alley in Alexandria, Indiana looking for something to do. We were dropping pills, mescaline, if I remember correctly. Someone mentioned this “Jesus House” in Anderson. They said that a large group of young people were meeting at a house called “Gerry’s Place” every night, singing songs and talking about Jesus. We had heard of it and we were curious. With nothing else to do, we were on our way to check this place out. When we arrived, Myrtle, Gerry’s mother greeted us. She informed us that everyone had been up late the night before for the New Year so everyone was already gone for the night. But she invited us to visit a house where a group of these “Jesus Freaks” were hanging out that night. Little did we know that Myrtle had called ahead so they would be prepared to minister to us. By the time we arrived, it was a past 9:00 pm. They were together in the living room singing songs, praying, and reading from the Bible. We were welcomed and invited to sit in and listen. I felt comfortable because every one looked just like me: long hair, same age as me, the holes and patches on our jeans. But something was different; they all had smiles on their faces as they sang and prayed. They read the scripture with an understanding I did not have. They shared a love I did not know. Later on that evening, they asked if they could pray for me. I don’t know exactly what happened but it did not take long before the Holy Spirit was speaking to me. My heart began to ache. I felt guilt for not following my early beliefs in my Christian faith. I asked for forgiveness and strength. I had been raised in a small Disciples of Christ church across the street from my grandparent’s house. My parents were married in the church. On a Sunday before Easter, probably 1964, I went forward and made my public confession that I accepted Jesus as my savior in front of the congregation. I was 12 years old then. I was baptized there in the church as an act of my faith in Jesus. However, within a few years I wandered away not pursuing my faith and I just became a churchgoer to appease my parents. Now that I was eighteen and half I was facing my convictions as the Holy Spirit was clearly speaking to me through these Jesus People. Like a miracle, the effects of the pills were lifted and I felt the presence of God in that room. I begin to ask questions. I don’t remember what they were but I do know I was impressed with the answers and the love these “Jesus Freaks” were giving me. I stayed up late again that night not wanting to lose this presence of God I was feeling. The next morning woke up knowing that something had happened. I still felt the presence of God. I could not wait to go back that night to spend more time with my new friends. I don’t remember if my old buddies felt the same as I did but a couple came along with me to spend that next evening at “Gerry’s Place.” I was there, not just physically, but in spirit with an open mind. I met the other brothers and sisters who made the same decision that I had. God was speaking to them through his Holy Spirit. Gerry Street and his mother were kind enough to open their house every night for almost two years giving people a place to meet God and grow in His love. Gerry made an impression upon me as he sat for hours singing his own songs of love and Jesus. 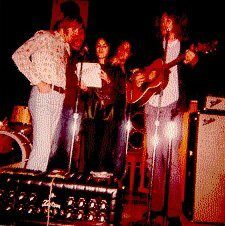 He would read from the Bible and share his message of love as others would read along, take notes and sing with Gerry as he sang. But it was not his voice or his artistic guitar playing that affected us so. It was not that Gerry was a great speaker because he was just average. It was simply Gerry's desire to share God's love with us and anyone who came into his home. One night after meeting with this group every evening for several days, it was late and I was ready to go home. A small group of about ten of us we were praying in a circle with our arms around one another. The presence of God was strong and something was happening. It felt as though someone taken the top of my head off and was pouring warm water down inside of my body. At this moment, I fell to the floor feeling this warmth surging through my body. I wasn’t exactly sure what was going on but I knew it was God ministering to my spirit, soul, and body. When I awoke from my stupor, I noticed that others had experienced the same thing. We laughed and rejoiced together knowing that God had touched with his healing hand. We felt such peace and joy. The next day was different. How? At first, I could not have told you. All I knew the grass was greener, the sky was so much bluer, and I knew something had happened. Later that day I noticed my reading of the Bible had a power to it I had never felt before. It was as though the words were just jumping off the page. I felt as though I had been empowered with a deeper understanding of the scripture. Later I came to understand I had received the baptism of the Holy Spirit. I continued my commitment as I attended every meeting. We were like young birds waiting to be fed by the Holy Spirit. Every night something new would happen, a new revelation, a new song, a new visitor, or a new believer would join us. We were not aware that we were a part of a movement of the Holy Spirit until years later. Gerry taught us to be lead by the Spirit. Every meeting would flow in spontaneity. If Gerry had planned every meeting I am sure he would have failed to hold our attention, instead he trusted that God would meet with us and He did. Our times of song and worship were like a symphony with the Holy Spirit as the conductor. One night during our worship and singing, I remember praising God with words of English repeatedly until suddenly this language came from my gut spurting out of my mouth. I did not know what I was saying but I knew it was from God. Later on, it was explained to me through scripture that I was speaking in tongues. That gift has never left me. Today, anytime I release my spirit in private prayer, I find myself worshiping God in tongues. From that point on, my relationship with God has grown so much. Doctrines have come and gone, brothers and sisters have come and gone but the Holy Spirits work in my life continues to this very day. I am blessed. I praise Jesus for all that he has given me. Here is a clip from a broadcast of the Kathryn Kuhlman TV program, featuring the group Love Song singing the song "Welcome Back", the song which this blog was titled after. The Group is introduced by Chuck Smith, founder of the Calvary Chapel movement. You will need a high speed connection to view this video. As mentioned in my last post, Steve Massengale sent me a package of photos. 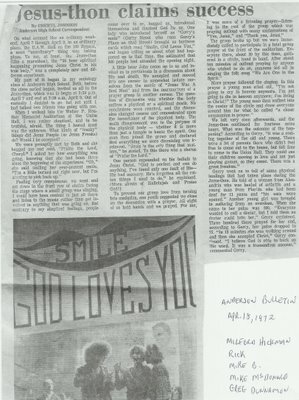 The package also included several newspaper stories and an article from a "Jesus Paper" published in Missouri. As always, if you have names for "unknowns" or corrections, please email us. Here are the photos and story about the Jesusthon. Unknown male, Tom Prough, Steve Massengale, Unknown male, Unknown female, Debbie ?, Don Purciful, Karen and John Renfro, Emma Posey, Unknown female, Unknown male. On what seemed like an ordinary weekend, April 7 through April 9, in am ordinary place, the U.A.W. Hall on the 109 bypass, the most “unordinary” thing was taking place. To me, at least, the Jesus-thon (like a marathon), the ’36 hour spiritual presenting Jesus Christ in his true body,” was a new and different experience. My part of it began in my sociology class at Anderson High School. Beth, before the class period began, invited us all to the Jesus-thon, which was to begin at 7:30 p.m. April 7 and end at 7:30 a.m. April 9. Out of curiosity I decided to go, but not until I had talked two friends into going with me. Feeling very conspicuous, we went and sat down in the front row of chairs facing the stage where a small group was singing. I would have been content to just sit there and listen to the music rather than get involved in anything that was going on. But contrary to my skeptical feelings, people came over to us, hugged us, introduced themselves and thanked God for us. On lady who introduced herself as “Gerry’s mom” (Gerry Street who runs Gerry’s place on 53rd Street) brought us business cards which read “Smile, God Loves You,” and began telling us about what had happened up to that time. She estimated that 300 people had attended the opening night. Gerry went on to tell of some physical healings that had taken place during the Jesus-thon. He told of a woman from Alexandria who was healed of arthritis and a young man from Florida who had been deaf for 11 years and “his ears were opened.” Another girl was brought in suffering from an overdose. When she came in her pulse was 200. “Everyone wanted to call a doctor, but I told them no doctor could help her,” Gerry explained. Three hundred there prayed for her and according to Gerry, her pulse dropped to 75. “In 15 minutes she was walking around and then she accepted Christ,” Gerry continued. “I believe God is able to back up His word. It was a tremendous success,” commented Gerry. I just received a package of photos and articles from Steve Massengale who worked alongside Jerry Street for several years. The photos and articles are from 1971-72 and they will be posted in the near future. I know from watching the information on our web counter that a lot of people are reading this blog. I believe that some of you are people who participated in the Jesus Movement/Anderson. If so, we really need your input on this page. We need photos and your stories. Without them this page will not be what it should be. Please consider writing an entry for the blog and/or sending us some photos. Also please pass this website on to other people who might be interested in reading it and telling their story. If you are unsure about what to write or need some help with editing just send an email to missionarymike2004@yahoo.com and we will do our best to help. We really would value your input and participation. Steve Massengale, David Moore, Jerry Street, Donnie Adams, Miguel ? Jerry brown, Tom Prough, Steve Heifner, Donnie Adams at Brenda Walker's parents home. 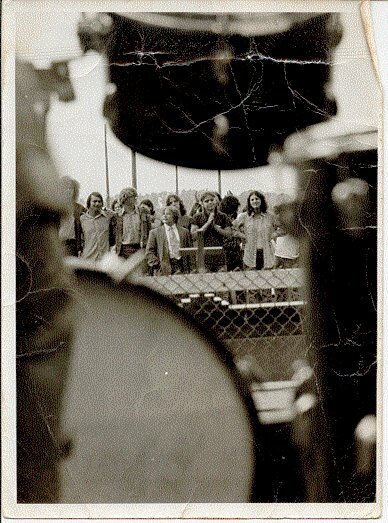 On April 8-9 of 1972 those of us who were regular attenders at Jerry's decided to have a "Jesus-thon". People were having walk-a-thon's so we thought "Why not?" I am not sure who first came up with the idea. It caught hold of us though and we began to make plans. Through one of our friends (I believe it was Mike Breese) we were able to rent the United Auto Workers union hall on the old 109 by-pass. We made our own posters, may have had a few advertisements on radio, and planned the meetings. We had the hall for 36 hours. We had bands play, Jerry sang and preached, we shared from an open mike, invited other speakers to participate and just had a good time trying to honor Jesus. People from Solomon's Porch/the Hill stopped in. Looking back on those days I sometimes wince at our naivete, but at the same time we were young, excited and zealous. Life and faith seemed simpler. Those days will never be repeated but we should remember them, gain insight from them and thank God for all he has taken us through. Below is Dave Holmes. He always had a camera with him. Thanks to Kim McBride (the daughter of Jerry Street) for the B&W photos. Thanks to Brenda Walker Williams for the color photos. If you have memories, photos, stories or correction to this article please let us know. On my last blog entry, I shared how I came to "Jerry's Place". Even though Jerry had named the ministry on 53rd St. "Where Angels Rejoice", for some reason, that name never did stick. It was always referred to as Jerry's Place or just Jerry's. As was quoted in the newspaper article posted below, Jerry never did advertise the meetings that he was hosting in the home he shared with his mother Myrtle. This was a spontaneous movement, a local tributary of the movement that naturally flowed into the national river that had already been named the Jesus Movement. My best recollection is that Jerry had invited a Pentecostal preacher from Indianapolis, "Pop" Bunch, to do a series of preaching meetings that were scheduled to last one week. By word of mouth young hippie types like I was, heard of what was happening and came en masse to investigate. As I mentioned in my first entry, something happened to me that first night that radically changed the course of my life. It is now thirty five years later and the change that took place has lasted. I not only came to Jerry's that night, I came to Jesus! I believe the day I spent at the farm house (mentioned in my first entry) that afternoon in the late summer of 1971, pondering my life and future, was heard by God as a prayer.....and He began to set in motion a set of sovereign circumstances to birth me into His Kingdom! When I crossed the threshold of Jerry and Myrtle's house that night, I was a young man with a wounded heart. I had been carrying the baggage of rejection for seven years and was in desperate need of the knowledge of God's unconditional love for me. Having been raised in a non Christian unchurched home, I wasn't even sure that God existed. I can recall going to church/Sunday school with a friend as a young boy on two occasions. I was freaked out by both experiences. I did try to read the Bible once while serving in the army at Ft. Bragg North Carolina. I was lying on my bunk and opened the New Testament that was given to us. A friend saw me and told me to start in the book of Revelation. Well, as you can imagine, that didn't bring me much relief. The rejection that I referred to was as a result of the night in 1966 when my dad woke me in the middle of the night to inform me that my mom was pregnant ( not by him) and had run off with her boyfriend leaving my dad to raise me and five siblings. I actually joined the army three years later in an attempt to escape the stigma of this experience. So, that first night at Jerry's, I was "ripe for the pick'in." The meetings at Jerry's continued for longer than a week. I know I was there almost every night for approximately one year. I also know that there was much controversy surrounding Jerry's teachings and at one point several of us left because of them. After thirty five years, I don't recall many of the details surrounding what was taught. But I do know what I caught. I received (whether through Jerry or divinely by the Holy Spirit) a revelation that God loved me unconditionally and that Jesus Christ is the Son of God who had died on the cross for my sins. He is the King of Kings and Lord of Lords who will return to the earth to establish a kingdom of righteousness, justice and peace and this kingdom is available to me by grace (it is a gift) through faith in Jesus Christ! I have always been, and will eternally be grateful to Jerry and Myrtle Street for opening their home and allowing God to minister to those of us that did not feel comfortable in the organized church. 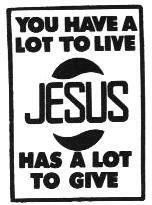 A few weeks ago I volunteered to write a story on the so-called “Jesus freaks” and the “Jesus Movement”. I decided the most effective means of research would be to participate in a nightly meeting of the freaks. I visited the home of Gerry E. Street on East 53rd Street where evening meetings are held each day. Before arriving I imagined scenes such as a couple of people sitting around smoking pot or shooting drugs in the names of God and Jesus. I arrived at Street’s home around 7:45 p.m. and was greeted at the door with a pat on the back and a solemn “bless you” from his wife (Blog editors’ note: Gerry wasn’t married at this time so the reporter must have been greeted by Myrtle “Mom” Street). Passing on into the living room where the meeting was to convene my premature visions seemed to be realized. I caught sight of two long haired boys sitting on the sofa smoking what seemed to be cigarettes. I also noticed a boy, whom many conservatives would term “hippie” quietly reading a Bible. A lighted cross shone in the window and on the wall hung an oil painting of Christ bearing the crown of thorns. As I fully entered the room I was greeted by a hand shake and many “Bless you’s’”. I spied the packages and found the boys where smoking cigarettes and not pot. One wall bore a poster displaying the words “Forget religion and find God.” I realized I was in for some kind of a night. Soon the crowd gathered with about 30 people sitting on the floor, standing in the hallway, and others in another room. Everyone seemed to know each other and I know they knew I was a newcomer because of the stares I received. 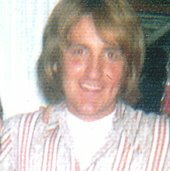 Most of the “freaks” had long hair and looked like teenagers except for Gerry who was middle-aged (editor's note - Jerry was 33 at the time, but looked older) and had reasonably short hair. A prayer opened the informal service. Everyone joined in a circle with their arms around the person next to them. The words “Praise God” and “Thank You Jesus” echoed with the spirit of God ringing throughout the room. Gerry took his place at the microphone with an electric guitar in his hands. He began singing songs he had composed about walking in the light of Jesus. There was not pot or alcohol present. Although some of these kids turned on in the past with marijuana and booze, they now turned on to God and Jesus. I have never in my life witnessed in any church such spirit of God as in these people. All through the night they shouted “Praise God” and that was just what they did. A short Bible study was conducted with Gerry Street translating the passages of the 15th chapter of John. Later on I got a chance to talk with Gerry personally. He told me the kids come to his house to get away from drugs because they have found out drugs do not turn them on the way God does. 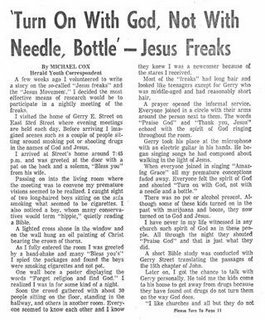 Gerry Street coordinator of the nightly “Jesus Spirited” meetings held in his home on 53rd Street in Anderson was once an alcoholic and drug-user. But he turned to Jesus, he says, when he decided alcohol and drugs were not fulfilling him. 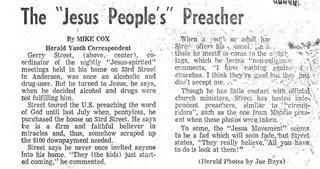 Street toured the U.S. preaching the Word of God until last July when, penniless, he purchased the house on 53rd Street. He says he is a firm and faithful believer in miracles and thus, somehow scrapped up the $100 down payment needed. Street says he never once invited anyone into his home. “they (the kids) just started coming.” He commented. (Blog editors’ note: The copy of the newspaper story we have is unclear here and part of the text is missing.) When a youth or adult has…..Street offers his counsel…..which he terms “non-religious”…. “I have nothing against churches. I think they are good but they just don’t accept me”. 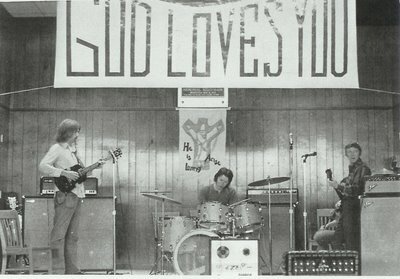 Though he has little contact with official church ministers, Street has hosted independent preachers similar to “circuit-riders”, such as one from Muncie present when these photos were taken. Above photo: Jerry Street seated front right, Steve Massengale behind with Mary Montgomery next to him. Marla Bell, Diane ? , seated front left. The man teaching is Charles Ressler from Muncie Indiana. In August of 1969 I entered the U.S. Army (shortly after graduating from Anderson High School). I was eventually stationed at Ft. Bragg, North Carolina with the 82nd Airborne Division. While at Ft. Bragg, I became more involved with drugs (I had begun to smoke dope in high school). Most of the guys I was hanging with were shooting heroin. I began to do lots of psychedelic drugs and was hanging out at a coffee house in Fayetteville. After eighteen months in the Army, and as a result of my involvement with the local antiwar movement, I went AWOL (absent without leave). I spent three months living in a commune in the Brushy Mountains of North Carolina. 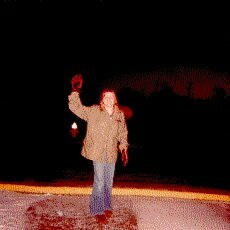 I came to the conclusion that I no longer wanted to be a part of Uncle Sam’s organization, so I hitch hiked to Ft. Meade, MD (just outside of D.C.), walked into the Military Police Station and turned myself in. Six weeks later I was released with an Undesirable Discharge. 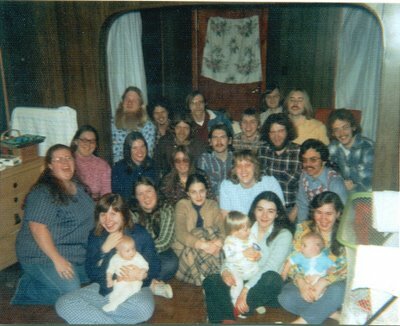 When I returned to Anderson, I discovered that most of my friends had also become hippies, so I moved into the farm house that they had rented just outside of Summitville. There were several that lived there off and on that summer. None of us worked. Actually, I think Sharla was the only one that worked. We were selling drugs for a living. We were making trips to Atlanta and Cincinnati to buy. Obviously we were also doing a lot of drugs. I was starting to do a lot of introspective thinking. The more I considered the direction that my life had taken; about having been discharged with less than honorable conditions, getting high every day and not really having much hope for my future, the more I became depressed. I recall one afternoon I was the only one at the house and just began to wonder what my life would be like when I was fifty years old. I became very depressed thinking about it. The depression continued for several days. One afternoon we went to a house in Anderson to sell some dope to some friends. There was a guy there named Terry. 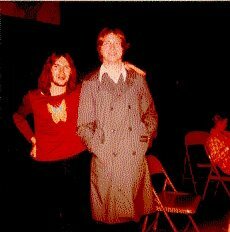 Terry and I had been very close in high school. I hadn't seen him for a long time. He had become a heroin addict and was living in Atlanta. The last time I saw Terry prior to this day, he looked terrible. 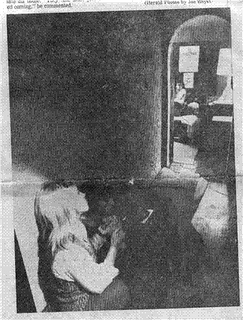 Terry was sitting in the corner strumming a guitar. When I asked what he had been up to, he said something like "just praising God." He began to tell me that he was no longer strung out on heroin and he didn't do any drugs now because of what God had done for him. I remember having a negative reaction to his statement. He started telling me about some kind of meetings he was going to on 53rd Street and then he gave me a card that said, "Smile God Loves You." The next day, some of us started talking about how much Terry seemed to have changed and how good he looked. Someone mentioned that we check out this place. We were supposed to go to a concert in Cincinnati, so I had mixed feelings. I wasn't really interested in religion and I really wanted to go to the concert, but I couldn't deny how much better Terry looked than the last time I saw him. I think subconsciously I was hoping that I could find some relief from my depression in the same way Terry was relieved of the heroin addiction. So several of us went and got there late. The house was filled with young hippie types and smoke. The smoking didn’t bother me since I smoked cigarettes as well as joints. Since I had no religious background, I didn’t even think that the smoking might be a bit out of place for a Christian gathering. What did bother me was this old guy (Pop Bunch) that was preaching and he was freaking me out as he walked around the room and squinted at me with one eye closed. At the end of his preaching, he said he wanted to pray for anyone that wanted to receive Christ. I am paraphrasing and actually only assuming that's what he said because I didn't really know what he was talking about. I remember that a girl named Beth asked if I wanted to be prayed for. I was very hesitant at first. One of the guys with us, Jim, coaxed me into the circle that they had formed. I think he wanted me to be the guinea pig so he could see what this was all about. I recall that I approached the experience the same way I did drugs, I’ll try anything once. So I stepped into the circle and they all gathered around, put their hands on me and started making a whole lot of noise (I guess they were praying). I remember most everyone was saying something about Jesus. Almost immediately I felt my feet and legs begin to shake and this rumbling feeling began to engulf my whole body. I thought I was going to pass out. Sharla then got in the middle and seemed to be having a similar experience as me. I recall that she seemed to get very emotional. When we left later that night, I knew I felt different. Not just different, but radically different. I could tell the depression was gone. I felt happy and hopeful. In the days that followed, Sharla and I wanted to go back, but none of the others were much interested. We began going every night and she and I decided we were finished with drugs. During this time we were letting a local band named Sunshine practice in our basement. One night the lead guitar player showed up for practice and it was the wrong night. They were to practice the following night. So, I stood and talked with him in the kitchen for awhile telling him about my experience at Jerry's. He was asking lots of questions and seemed really interested, so I asked him to come with Sharla and me. He said something like "well maybe this is why I came tonight." So we took him and by the end of the night we were praying for him too. That was Greg Hough’s introduction to Jerry's Place. 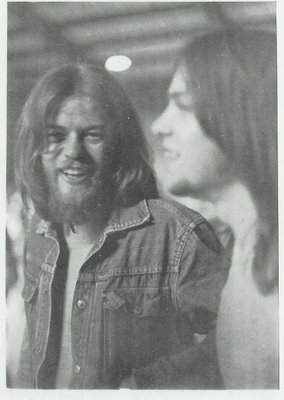 (Editor’s note: Greg Hough later became lead guitarist for “Petra” one of the first nationally known Jesus Rock bands’. 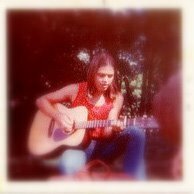 Greg played with the band for several years).I continued to live at the farm house for awhile. One night I didn't go to Jerry's, I think because I didn’t have a ride. There were several people at the house getting high smoking dope. I was turning them down every time they passed the joint around. One of the guys, Mark, said something like "you can at least drink some wine with us." He seemed to be getting upset with me, so I decided to take a few drinks of the Boone's Farm. It wasn't long before I realized that he had laced the bottle of wine with LSD. Once I began to get off on the acid, Mark appeared to be the devil incarnate to me. I retreated upstairs and obviously had a very bad experience. I remember becoming very aware of the demonic realm that night. I think I had my first spiritual revelation that night also: with friends like this, who needs enemies. I knew that I had to get out of this environment, so within a few days, I moved back home with my dad. I think Sharla also moved home soon after I did. I then continued going out to Jerry’s almost every night for about a year. 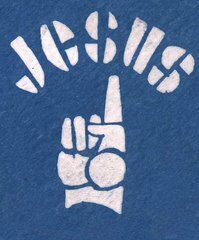 The Jesus Movement was a nationwide, if not worldwide phenomenon which reached the youth/hippie/drug counterculture of the late 1960s and early 1970s. That time period was a tumultuous era. We had seen a president assassinated, the widening Viet-Nam war and the rise of a popular youth counter-culture fueled by rock music and drugs. Many American young people were disillusioned with the American lifestyle and our involvement in Viet-Nam. Eastern religions were gaining a stronghold among young people and a large proportion of us experimented with drugs. To many people's surprise, in the midst of this there was birthed a true spiritual awakening which was ingnored and missed by most mainline, evangelical and fundamental churches in America. Those few churches which recognized and encouraged the movement such as Chuck Smith's Calvary Chapel (Smith's roots were from Aimee Semple McPherson's Foursquare Gospel Denomination), reaped a huge harvest. In many places the fledgling movement was left on it's own, with young often immature leadership, trying to find their way toward stability without become the religious institutions they had seen as they grew up. The Calvary Chapel Association of Churches owes it's existence to Chuck Smith's embracing of the Jesus Movement and his providing oversite and leadership to many emerging leaders. The Vineyard Association of Churches was also deeply affected by the Jesus Movement. 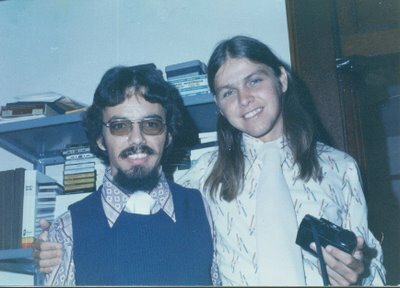 Lonnie Frisbee (www.lonniefrisbee.com) a young hippie preacher in California helped bring thousands of kids to the Calvary Chapel movement. Later, Frisbee worked with John Wimber as the Vineyard Fellowship of churches was begun. Today, all across the United States and the world there are many leaders who trace their spiritual heritage back to a coffee shop. house meeting or some other manifestation of this awakening. Several major cults were born during this period and populated by kids form the Jesus Movement. 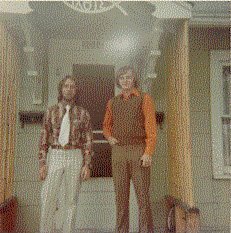 The Children of God cult, founded and led by David Berg was/is the most notorious, and following them was the group simply called "The Way" based out of central Ohio. Many smaller cults and aberrant Christian groups sprang up also. Young people, often without the benefit of their own maturity and lacking any real spiritual parents fell into the trap of these cults and for some it was a devastating occurrence. In Anderson Indiana the Jesus Movement manifested itself in two parallel streams among the regions youth (this is a broad generalization). The first stream was birthed out of the Anderson Revival. It drew many of it's adherents from young people in local churches and students of Anderson college. It was centered around the ministry at Solomon's Porch and later "Teen Hill", more commonly called simply "The Hill". The second stream of the Jesus Movement was centered around a home and a man and his mother on East 53rd Street. 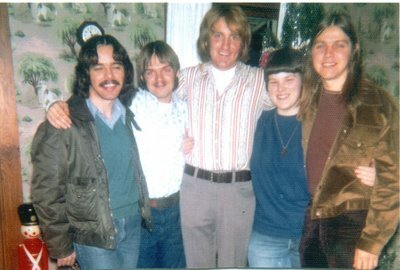 in the summer of 1971 Jerry Street and his mother Myrtle Street open their home for young people to gather, listen to Jerry teach and sing, hear speakers from Indianapolis, Muncie and other places and come under the influence of the power of God. Jerry Street's ministry was not conventional and many religious leaders were wary of him. He was deeply influenced by the 1950's Healing Revival and the fringes of the Latter Rain movement, both of which were known for wild excesses and sometimes bizarre teachings. At times Jerry taught some very unconventional and controversial doctrines. However those who stayed with and knew Jerry in the early 1970's would agree that he was a man of personal integrity. He was not motivated by money, position or power. He genuinely loved the young people he gathered around him and despite some glaring issues he loved God with all his heart. He never manipulated those who followed him and a number of people found Christ during those days in 1971-72. As we turned from our teens into our early and mid twenties the Jesus Movement began to fade. Our culture was changing, we were growing up, getting jobs and beginning families. The hippie, counter-cultural lifestyle was no longer as relevant and the movement began to morph as we needed new forms to meet our changing needs. The Jesus movement in Anderson gave birth to The Fellowship of Christian Believers, a non-church church which for it's time was, growing, dynamic and innovative. Many of us who had survived the turbulent days of the Jesus Movement became a part of this new fellowship. Our next post is the story of Randy Hornbeck. 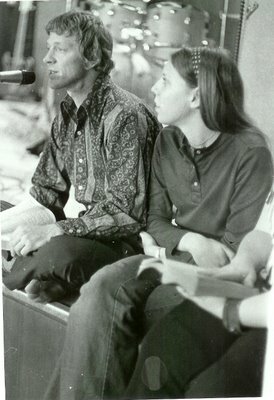 Randy was a young man who was seeking peace and meaning and was following the usual path of the late 1960s early 1970s. He came to Jerry's almost by "accident" and found the Lord who had been drawing him all along. Next week we will post an article about "Jerry's Place. The ministry of Jerry Street. If you have any memories, or photos you can share please let us know. In the near future we will begin a series of "Where Are They Now" posts. We want to let our readers know what some of your old friends are doing these days. We hope this will give people an opportunity to reconnect after all the years. Thanks to Brenda Walker Williams for these photos! Photo #1 - The front porch of "The Porch". Note the "ICKTHUS" sign above the porch. 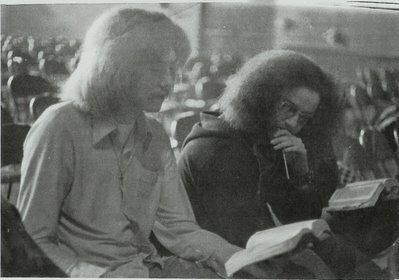 Tom Pickens and Bud Sempsrott. Photo #3 - Ron McNeil, Don Whitesel, Tom Pickens, Russ Willis. "The Children of Light"
February 20th of 1970 at 2 p.m. I received a call from a lady who attended South Meridian Church of God. She told me they had such an exciting service that she was still at the church. A group of students had come from Ashbury College to talk about a revival that had broken out on Campus. The response was overwhelming and Pastor Tarr had decided to continue services as long as the Holy Spirit led. The lady had called Park Place Church to get the phone number of some girls who could possibly help in the nursery. They told her about Roxanne Ogle, Polly Thompson & me. They were willing to pay us each $1 per hour as nursery workers. This was my first paying job (I was 13). The first night I worked with the 3 & 4 year olds and we had around 30 children in that room. They asked me to come back the following night and I worked in the toddler room with Roxanne. The third night I worked in the infant room. They had a sound system that monitored the service and for some strange reason all the babies were quiet and sleepy that night, so I listened to the service. The service consisted of testimony after testimony of how God was changing the life of each one who spoke. People spoke about the new and real feeling of God’s Love they were experiencing in their lives. The first night, as I entered the church I had felt something different in the air. Everyone you saw was excited about Jesus and talking about Him in a way I had never heard before. That night I felt compelled to make my way into the service and ask Him to take control of my life. For the full 50 days the Revival I was there (although the first three nights I was in the nursery). As I remember the theme song we sang each night was "To God Be the Glory", and there was a sign there that read "God's power shows up best in weak people". The people I remember from those Revival services are Ray Renner (he testified several times), Johnny Cawthon (he later was the leader of the Youth For Christ meetings I attended at North Side Jr. High) and Royce Miller (who went on the witness team to VA with me). Two times I went out on witness teams. Once I went for a weekend in Ohio and on another occasion for a week (over spring break) I went with a team that went to my grandparents church in Blacksburg, VA, my Uncle Jim’s church in Roanoke, VA, a church in Bristol, VA and another church somewhere in North Carolina. The way the witness teams’ services that I participated in usually went were: The local pastor would open with a few songs. Each person on the team would then give their personal testimony. Following the testimonies there would be an altar call. Because the Holy Spirit was so strong and in evidence it would not be uncommon for every person in the service to respond to God’s call. Later in June of 1970 at the Church of God Convention the Fishermen had some type of a gathering I think in the basement of the Student Union Building (Bud Sempsrott, Ray Renner or Lawrence Chewning can correct me if I’m wrong about the location) and Tom Pickens caught the fire. The Fishermen went traveling over the summer. 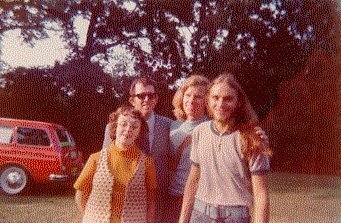 I think in September of 1970, when they returned to Anderson and began meetings at Solomon’s Porch. 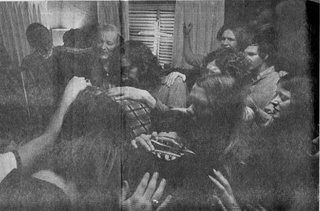 In February 1970, a spontaneous spiritual awakening occurred in the city of Anderson which resulted in a fifty day revival, three services a day. Hundreds of people accepted Christ during this time, warranting a full page story in the Chicago Tribune. Lawrence Chewning, then a student at Anderson College (now Anderson University) was very active in this revival, traveling on weekends with other students to various parts of the nation in order to give their testimonies. 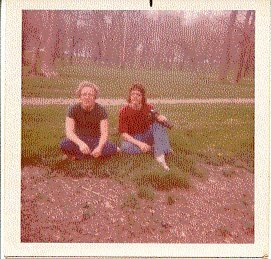 In the summer of 1970, Lawrence banded together with several other friends and began traveling full time. They called themselves "The Fishermen" and within a couple of years, evolved into a music group featuring original songs penned by Lawrence. During this time, Christian music was experiencing a breath of fresh air as young people began to write and sing of their love for Jesus in a more contemporary style. The Fishermen became part of this movement and began performing in coffee houses, college and high school campuses, Jesus festivals and outdoor concerts throughout the Midwest, the South and the New England states. During one of the Fishermen concerts at a Christian coffeehouse in Hartford City,Indiana, a teenager named Ray Boltz accepted Christ. Ray went on to become an award winning Christian recording artist. Thanks to Lawrence Chewning's web page (see our links) for this post and the following 2 photos of the Fishermen in the story labled "The Fishermen". 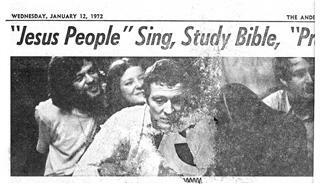 One morning in 1970, without warning, all heaven broke loose during Asbury (KY) College's 10 a.m. chapel service.....thus began the "Asbury Revival" which later gave birth to the "Anderson Revival". Students from Asbury college began to spread across the country telling about what God had done on their campus. Wherever the Asburyians traveled, revival followed. 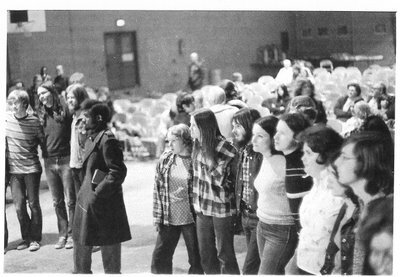 By the summer of 1970, the revival had reached more than 130 other colleges, seminaries and Bible schools, and scores of churches, according to published accounts. It spread from New York to California, and even to South America. When several Asbury students gave their testimonies at the Meridian Street Church of God in Anderson, Indiana, for instance, the church experienced a spontaneous revival that lasted 50 consecutive nights. According to old clippings from Indiana newspapers, the Anderson church soon became so packed that the services had to be moved to a school gymnasium. Up to 2,500 people a night flocked to the gym in hopes of being touched by God. This blog is the result of conversations I have had with several old friends. 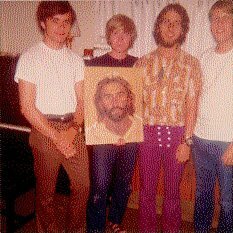 All of us were participants in and affected by what is commonly called "The Jesus Movement", that extraordinary time in American culture and history than roughly began around 1967 and ended in 1973. We all lived in central Indiana during that time period, coming from Anderson, Alexandria, Muncie, New Castle, Middletown and other places, some from across the country.The primary focus of this blog is to remember the good times and perhaps bad times that we experienced during those hectic, exciting years. We are all older now and hopefully somewhat wiser. Many of the things we saw and participated in have had a lasting impact upon our lives. This is not my blog, but rather it is our story. The story of a bunch of kids, some who were searching and some who were not. Many of us found something which dramatically changed the rest of our lives.I encourage you to contact me via email. Tell me your story, send me any pictures you have. Let's hear your "testimony". What did those times mean to you and how do you remember them now? If you want to contribute to or comment on this blog send us an email. We need your help keeping the information on this blog accurate. If you see any mistakes in names, dates, typos or other wrong information please send us an email so we can make the corrections. This web page is the property of the authors and the opinions expressed are their's. We solicit articles and memories for publication on the web page but reserve the right to edit articles for clarity and readability. If you disagree with any statements made or opinions expressed on this website please email us and we will happily discuss them with you.